90° Hybrids are widely used in Image Reject Mixers, SSB modulators, I & Q Modulators, QPSK Modulators/ Demodulators,Vector Modulators, Antenna Feed Networks and Balanced Amplifiers. Our broadband 3-port 90° hybrids are used in applications, where extremely wide bandwidths are required. 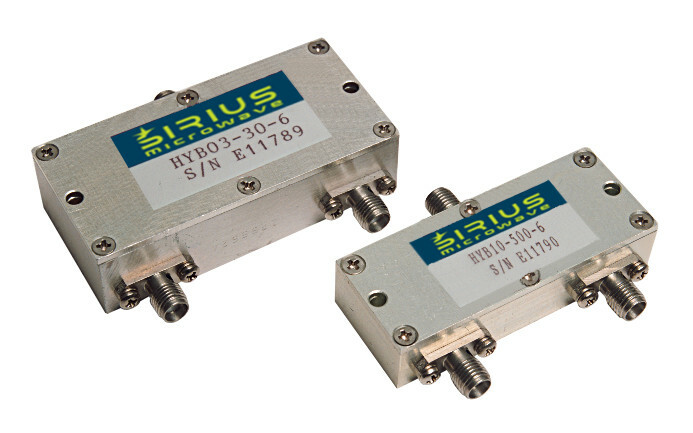 Sirius Microwave offers a line of multioctave 90° Hybrids with bandwidth ratios of up to 1000:1. Also various types of narrowband, octaveband and custom design units available. Contact factory for details here. Parameters are measured in 50-ohm system.